A grandparent asks… why are we going backwards? On Grandparents’ Day, Barbara Burke looks at three generations of toys and toy marketing. As a child of the forties and fifties, a parent in the seventies and eighties, and a grandparent in the twenty-first century, I’ve seen a lot of changes in what parenting involves. For myself and my daughters there is now far more freedom in the workplace compared to my mother’s generation. Modern parenting means convenience; microwaves, disposable nappies and collapsible buggies all make the world of difference. Back in the fifties children had far fewer toys than children today, and many were shared or passed down between brothers and sisters. 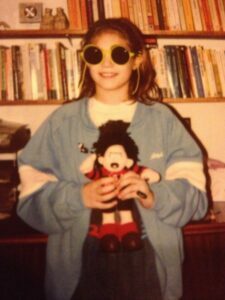 As a child I was given dolls and my brothers weren’t, but other than that I had a pretty free rein. My books, my bike and my roller-skates were particular favourites. 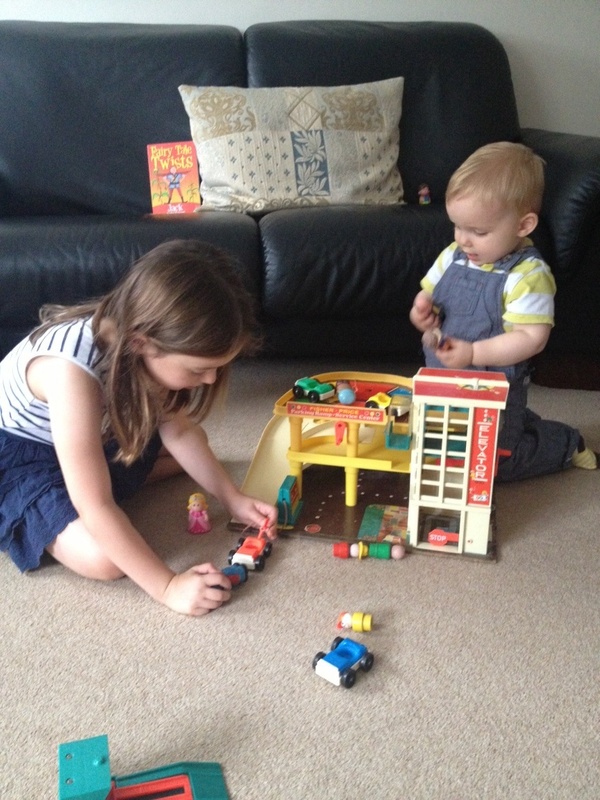 My daughters in the seventies and eighties enjoyed a range of toys too: Lego, board games and a much-loved toy garage (still enjoyed by the grandchildren today – see below!). Each of my daughters enjoyed playing with “small world” toys and it would never have mattered if they had a Polly Pocket or a Transformer in their hand, all were played with in the same way. Adverts showed boys and girls playing together, and toys were produced in bright primary colours. For my grandchildren, however, something has changed. Adverts now only seem to depict two types of child: a passive, glittery female one, or a boisterous male one. Some of my favourite toys from when my children were young are now only available in a choice of pink or blue, and insidious ‘boys’ and ‘girls’ signs have started to appear in toyshops. I see how much marketing affects my grandchildren and hear “but that’s a boys’ toy” far more than I ever did from my children. Myanah, Grandmother to James and Emily. While my children were growing up I worked in education, and it would have been unthinkable to divide my classroom in the way shops divide toys. Children are children and each have their own personal interests. They all need to be challenged to learn a range of new skills, whether this is spatial reasoning, physical ability, or the need to share. The more toys and experiences each child is exposed to, the greater the likelihood that they will develop these skills. We make sure they have a range of toys available when they come to our house, so on one occasion they might play with their dolls and on another with their scooters. They never feel a toy is out of bounds. One of the joys of being a grandparent is the ability to step back and watch the children develop, without having to worry about sleepless nights or the tough decisions. Why would I limit their development by limiting their toys? I like how you mention outdoor toys – I was raised by my grandparents and spent my days outdoor playing with hand-me-down bikes, space-hopper etc and going birdwatching with my grandad. Nobody ever remarked that it was a tomboyish / masculine thing to do. As someone of the same generation, I couldn’t agree more – it horrifies me when I see toys that my children (1 boy, 1 girl) both enjoyed playing with marketed as ‘for girls’ or ‘for boys’. 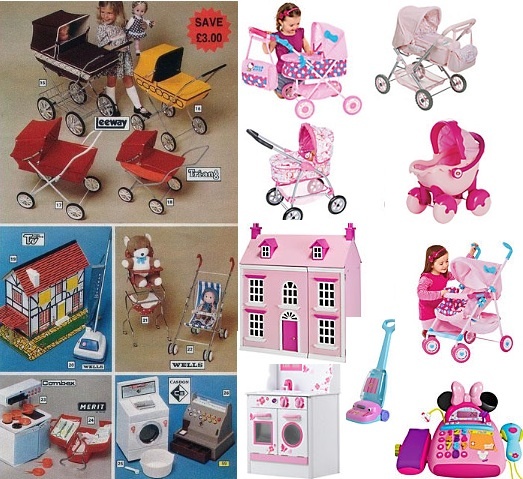 Even toys such as wooden tricycles are now made in two versions – one with multi-coloured wheels ‘for boys’ and one with pink wheels ‘for girls’..! As a grandmother I’m horrified by the ‘explosion of pink’ and I am determined that my granddaughter will have the widest choice and opportunity but I experienced gender bias from my parents – mostly from my mother. When my bother (who is 15 months younger than me) was given a scooter for Christmas, the following year I asked for one too but was refused on the grounds that I was a girl. A couple of years later he was given a bigger and better scooter and I was allowed occasionally to use the smaller one. 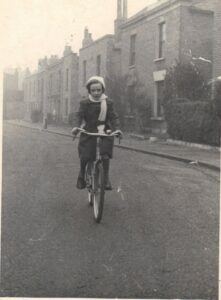 Then one Christmas my brother was given a Chopper bicycle – my parents were not well off so it was a major purchase – and his larger scooter was no longer wanted so out of sight I would use it. For the next few years when asked what I wanted for Christmas I would always say: a bicycle – but the reply was always the same, I was a girl, what would I want with a bike? The year of my seventeenth birthday, when asked the question and having given the same reply, my father asked if I was sure that was what I wanted. I told him it was and on Christmas day my bike was there for me – although it was a Raleigh Woman’s shopping bicycle! However my father had died the day before, on Christmas Eve, so never saw me ride it. I remember that garage! My grandparents’ best friends had it at their house and when I was a little girl (in the ’80s) it was my favorite thing to play with when we went to visit them. The color divide in toys now makes me so sad – my 7-year old stepson loves baking with me (he bought an apron with last year’s birthday money) but at most stores things like Easy Bake Ovens or even aprons are all pink. We found one online that we could customize the colors of (he chose blue and red) but just walking through most stores he would absolutely get the idea that baking is not acceptable for a boy. The funny thing is, it’s my daughter’s grandmother (my MIL) who tries to buy her ‘girl’ toys.